Hours: 7 Days/week 8:00 a.m. - 8:00 p.m.
At Delta County Memorial Hospital, our Emergency and Trauma department treat more than 14,000 patients a year. We are certified by the Colorado Department of Public Health and Environment as a Level IV Trauma Center and with our board certified emergency room physicians and specially trained registered nurses, we are ready to care for your emergency. We know that when you arrive at our Emergency Department, you may be in pain and/or not feeling well at all. We make every effort to start your evaluation and treatment as soon as possible. Any patient with a life threatening illness or injury will be seen IMMEDIATELY. Please understand that it is our duty to take care of those with the most serious issues first. Upon arrival, one of our specially trained nurses will triage you in order to prioritize your care based on your injury or illness, and the number of resources you will require. Based on this assessment, a nurse may suggest treatment from Urgent Care. For non-life-threatening and non-limb-threatening illnesses and injuries, Urgent Care treatments are often lower cost than ER visits with shorter wait times. You can choose to receive treatment from the ER, even if Urgent Care has been suggested. After triage a registration clerk will gather information from you such as name, date of birth, address, and insurance information. As soon as a bed is available you will be taken back to start your care. If one is not available when you arrive you may be asked to wait in the waiting room. Patients may not be seen in the order they arrived. Remember, we treat those with the most serious situation first. If you are not admitted to the hospital you will receive after care instructions to take home. It is very important to let the nurse or physician know if you do not understand your instructions. We want to ensure your treatment is successful so ask questions if you need to! There are options available for taking care of your bill, please speak to one of our clerks in order to make arrangements. 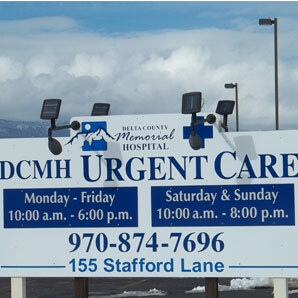 DCMH Urgent Care is a certified rural health clinic, accredited as an exemplary provider. Urgent Care is effective in treating non-life-threatening illnesses and injuries and for times when a primary care physician isn't available. There is no appointment necessary, all insurances are accepted and patients are served on a first come basis. If the acuity level is too high, a patient will be transferred to the Emergency Department. Thank you for choosing DCMH for your care. We know you have choices and hope to provide the most personalized and efficient care for your needs. No one wants to get emergency services, but if you need us, we'll be here.